Ringway 1 was the closest ring into the centre of London. It would have been the most intrusive, and the most costly. It was the sort of thing that that gives some people nightmares. And scarily enough, a fair amount of it was actually built, even though the 1969 cost was estimated to cost more than £1,000,000,000 back then, and about 36,000 people would have needed to be re-housed. Really? So where would it have run then? 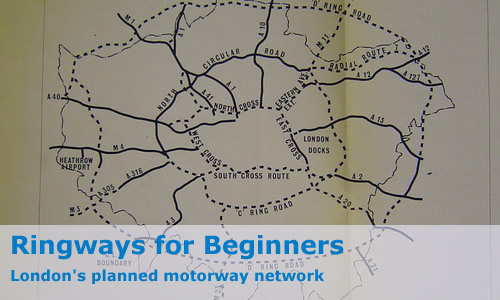 It's easiest to take Ringway 1 (or to give it its Sunday name, the Motorway Box) in four sides. After all, that's how it was planned. OK then, how about starting on the western side? Easy peasy. Some of the western side actually got built: the erstwhile M41 West Cross Route, along with the former A40(M) Westway - which although it wasn't technically part of Ringway 1, it can be considered to be so for our purposes. Let me guess - the next bit is the North Cross Route? Sorry about that - my sarcasm just go the better of me for a minute. The North Cross Route pretty much followed the North London Line from Willesden Junction all the way across to Hackney Wick, via such places as Camden Town, Hampstead and Islington. Only a tiny bit of the North Cross Route was ever constructed, right at the eastern end, and there is no evidence so far found to indicate that any motorway number was ever allocated. The East Cross Route is the unusual side of Ringway 1. It was almost fully constructed and is pretty much intact today, surprisingly enough. Whilst the whole side of this side of the Box is known as the East Cross Route, only the section to the north actually uses that name, and there was a non-motorway section in the middle: the Blackwall Tunnels. The northern section was once known as the A102(M) East Cross Route, whilst the southernmost section went by the name of A102(M) Blackwall Tunnel Southern Approach. The missing section of the East Cross Route is very simple - a third Blackwall Tunnel was planned in order to replace the earliest tunnel, which would have been converted for use by local traffic. I see. One left - the South Cross Route! The South Cross Route is the most mysterious side of Ringway 1, and didn't get a single part built. The engineering diagrams and reports that should be available (and are for the other three sides) have disappeared and no trace has yet been found. Despite this, research has turned up the route in reasonable detail, though in fragments at a time! From the southern end of the A102(M) Blackwall Tunnel Southern Approach, the route would have headed west through Blackheath, then had a short spur to New Cross and followed the South London Railway through Brixton to Clapham Junction, would head across the Thames to meet up once again with the West Cross Route.